During the period of winter, we often assume that the safest place to keep our priceless vehicles is inside. In the case of eight Chevrolet Corvettes, car enthusiasts who believe this normally sound decision will be sadly disheartened by a rather epic event. At 5:44am on Wednesday in Bowling Green, Kentucky, the result of a sinkhole under part of the National Corvette Museum was first discovered. Occurring in the Skydome area of the 115,000 square-foot faculty, a 40-foot diameter opening caused the floor to cave-in to a 25 to 30-foot depth. An area of the National Corvette Museum spanning 140 feet in diameter, the Skydome enclosure is advertised to hold over 30 special Chevrolet Corvettes. 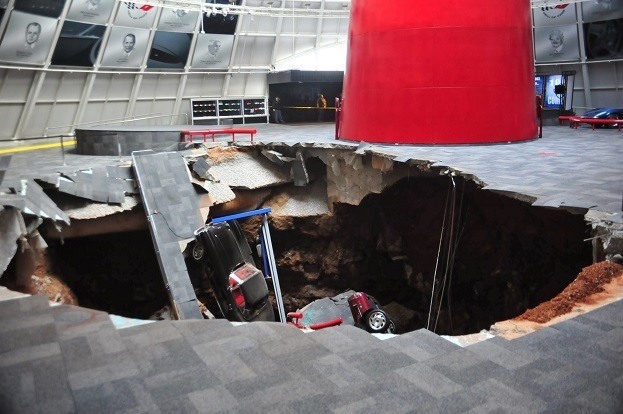 With great sadness, the National Corvette Museum announced that eight vehicles were casualties to the sinkhole. The oldest vehicle affected is a black 1962 Corvette and one of the newest examples was a white 2009 Chevrolet Corvette bestowed with the distinction of being the 1.5 millionth produced. In addition to the 1.5 millionth Corvette built, the one-millionth Chevrolet Corvette manufactured in 1992 is also among the vehicles claimed by the sinkhole. A 1993 Chevrolet Corvette 40th anniversary edition, a 1984 PPG pace car and a Mallett Cars prepared 2001 Corvette Z06 Hammer are other National Corvette Museum owned pieces mentioned as being involved with the damage caused by the large, unexpected hole. Two unique ZR-1 versions of the Chevrolet Corvette loaned to the museum from General Motors are the remainder of eight cars affected. One is a rare 1993 ZR-1 Spyder and the other is a pre-production C6 version of the Corvette ZR-1 known as the Blue Devil. The extent of the damage to each specific Chevrolet Corvette is unclear at this time. Without doubt, enthusiasts of the Corvette are hoping these examples America’s favorite sports car will be restored to display-quality condition quickly. The fortunate side to the news was the sinkhole collapsed did not happen when Corvette fans or employees occupied the museum area. The sinkhole also appears to have not damaged some other prized examples of the 60-plus year-old sports car nameplate. Namely, the only 1983 Chevrolet Corvette built, housed in the Skydome, is not among the injured vehicles. National Corvette Museum Skydome area image taken in 2009. An 115,000 square-foot faculty, the National Corvette Museum opened across the street from the assembly plant in 1994. 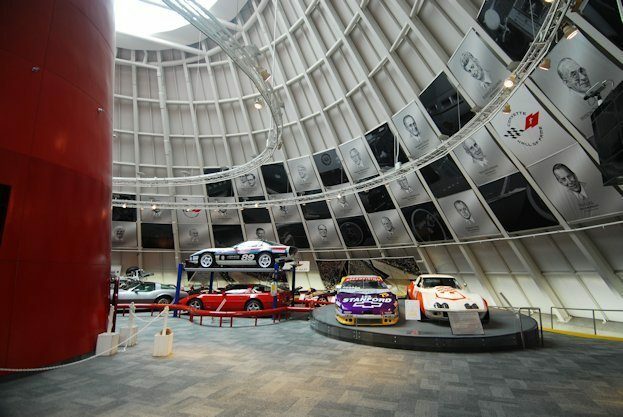 In addition to over 80 cars representing the history of the Corvette, the museum also features a number of interactive exhibits and historical pieces. The National Corvette Museum facility also includes a conference center, store and café. As a structural engineer has been called in to assess the sinkhole situation, will remain close at least through Wednesday. 1 Comment on "Eight Corvettes Affected by Sinkhole at National Corvette Museum"